Meet Feruza Ahrarova, whose enticing store at the entrance to the first cupola in Bukhara, stops you in your tracks with its riot of fabrics and designs. 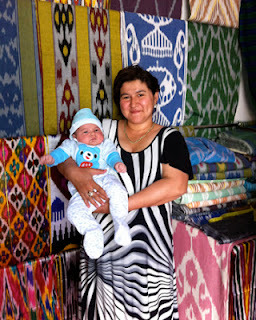 She specialises in gorgeous Ferghana ikats. Although there are a few ikat stalls in Bukhara, I am always drawn back to Feruza's because of the range and quality of her fabrics, and because she is such a marvellous woman. Born in the old walled city of Bukhara, her father was a university teacher and her mother a technologist at a cotton factory. Even in Soviet times the family ran two small souvenir shops in the first cupola area, right near Lyabi Haus. Feruza spent her after-school hours and weekends hanging around listening to tourists, improving her English and noting how different groups of people liked different items. After graduating from university, a space came up for rent near her parents' shops and she decided to open her own tiny boutique, initially selling antique goods, especially textiles. Tourists liked the traditional patterns; however, the quality of the fabric was variable and long lengths unavailable. At the same time, Ferghana ikat producers started making new ikats using the old patterns. 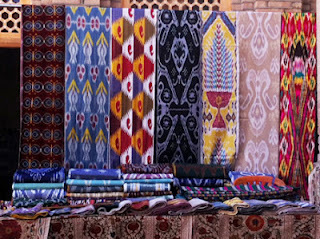 Feruza saw an opportunity: offer beautiful silk and cotton ikats in palettes and patterns that appealed to visitors. Feruza studied the traditional fabrics at the Bukhara Museum of Applied Arts and poured over books on traditional ikat patterns. 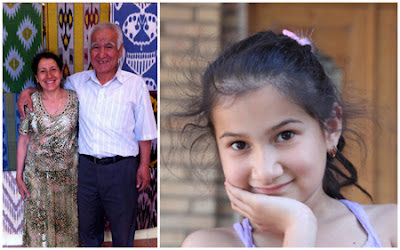 In Margilan, the centre of Ferghana's ikat production, she met master weaver Rasulkhodja with whom she works closely to produce her special ikats in new and old designs, based on feedback from her clients about colours and patterns. Originally visitors bought fabric for making cushion covers and table runners. Now that ikat is a global design trend she notes that some people are buying 20 or 30 metres for major interior statements. Her direct collaboration with Rasulkhodja means that her fabrics are keenly priced: silk velvet ikat is US$30 per metre, adras (silk/cotton mix) US$15 per metre and cotton ikat US$5. Most ikat is between 35cm - 50 cm wide. She can also arrange DHL shipments. Unique to Bukhara, Feruza offers a made-to-order service usually with a 24-hour turnaround, e.g. cushion covers with zippers can be made for the fabric cost plus $2.50. Custom table cloths, place mats and tote bags are also possible. 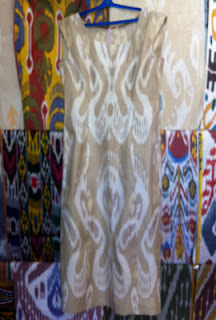 If you fancy an ikat dress or trousers, it is best to bring a sample to copy. Feruza is a genius at matching the patterns at the seams. Her shop is always bustling with tourists and friends from the neighbourhood. Often a picnic table is installed opposite the shop and the women stall holders gather there for lunch and gossip. You will be warmly invited to join. Feruza's father taught her that "if you have soft heart, people will treat you with a soft heart". And so it is that people enjoy spending time with this big-hearted woman. Her family has recently embarked on a major project: the renovation of an old Jewish merchant's house behind the nearby art museum. It belonged to a long-time friend of Feruza's, Bella, the local hairdresser, who emigrated. Feruza plans to lovingly restore it, live there with her family and offer home-cooked traditional meals for friends and visitors. Do visit Feruza's store when you are in Bukhara. It is impossible to miss! It opens daily around 10:00 a.m. and closes late, usually around 8:30 p.m.